Scala programming language, which also operates on the JVM, can play nicely with many of the operational and monitoring tools as well as with Java and other languages. Scala shares many simple and readable syntax features of other programming languages. It has various productivity advantages and allows developers to work more effectively. Developers often characterize Scala as a more functional language than Java. Actually it’s a mix of object-oriented and functional programming. Such languages like Scala often attract flexible, highly skilled and innovative developers, which form great technical teams. So, let’s see how this highly flexible language works in the cloud! 1. Log in into Jelastic and click on the Create environment button. 2. Create your environment in Jelastic e.g. with Tomcat 7 and Java 7. 1. First of all download and install sbt for your OS. It is s a build tool for Scala and Java projects. "org.mortbay.jetty" % "jetty" % "6.1.22" % "container"
Note: Blank lines are required in order to separate each item. The WAR archive you have just generated will be stored in thetarget/scala-x.x.x directory. 5. Go back to the Jelastic dashboard and upload your WAR package to the Deployment Manager. 6. Deploy your Scala application to the environment you’ve just created. 2. Navigate to your project base directory and create build.sbt file. Specify the name of your app, its version, version of Scala and specify the keys for Jelastic plugin. email in deploy := "your_email_address"
password in deploy := "your_jelastic_password"
environment in deploy := "your_jelastic_environment_name"
context in deploy := "context_for_your_app"
4. Use the upload task to build a WAR file and upload it to the Jelastic Deployment Manager for further its deployment. Use deploy task to build a WAR file, upload and deploy it to the specified environment and context. Voila! 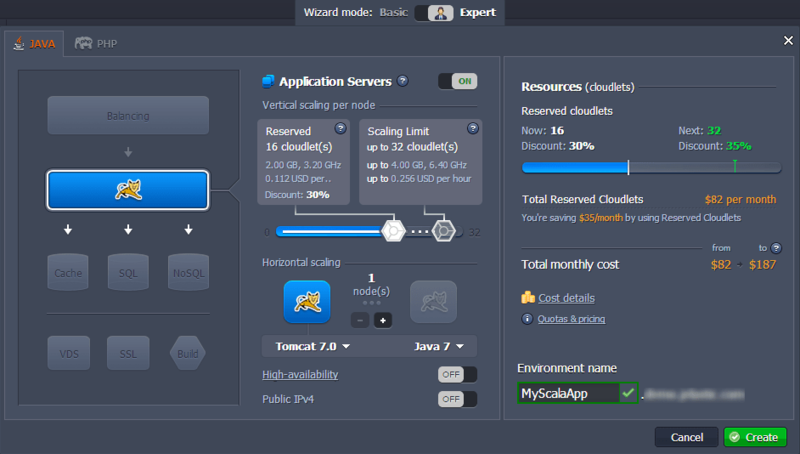 See your Scala app in the the Cloud! This was just a simple example to show you how to get started. You can use any of the mentioned above plugins for creating your Scala WAR package and deploying it to your environment. If you have any questions regarding this topic please let us know in the comment section below. Published at DZone with permission of Marina Sprava , DZone MVB. See the original article here.